Most Americans Support Graphic Warnings For Cigarettes : Shots - Health News A majority of Americans favor the stark cigarette labels FDA has proposed to deter smoking, according to a nationwide survey conducted by Thomson Reuters for NPR. About 42 percent of current smokers even support the tough warnings. How Do You Really Feel About Smoking? 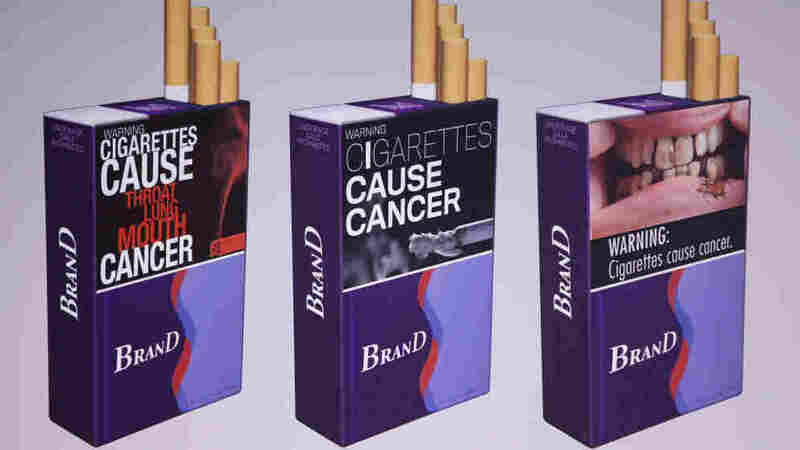 Three examples of proposed warning graphics that will appear on cigarette packaging as part of the government's new tobacco prevention efforts. Now that the Food and Drug Administration has the power to regulate tobacco and is starting to flex its muscles, we wondered how Americans are feeling about smoking. So our pals at Thomson Reuters agreed to ask a slew of questions about smoking and cigarettes as part of their latest nationwide health survey. First, here's a little bit of info about the more than 3,000 people who responded to the telephone survey. More than half — 56 percent — said they'd never smoked. Slightly more than a quarter are former smokers and about 17 percent smoke now. Now the findings. A little more than half — 54 percent — of people surveyed are in favor of those graphic cigarette labels FDA has proposed to deter smoking. About 24 percent oppose them. Digging deeper, the data show 42 percent of current smokers support the warnings and that 21 percent strongly oppose them. So do anti-smoking ads and messages work? Most people don't really think so. A little more than three-quarters said they had no influence. Yet, some 22 percent of current smokers said the ads had led them to smoke less, and 11 percent of former smokers said they'd helped them quit. Now, what about taxes? The median tax on a pack of cigarettes is $1.18, according to a report from the Centers for Disease Control and Prevention on states' efforts to combat tobacco. Opinion is divided. A little more than third of people say taxes about about right, and a little more than a third think they're too high. The rest say they're too low. Only 2 percent of current smokers think the taxes are too low. Three-quarters of smokers think they're too high, as you might have expected. The survey was conducted during the first two weeks of December. The margin of error is plus or minus 1.8 percentage points. For the full results and the text of the questions, go here.